The 28 member countries of the European Union have unanimously declared that they do not recognise Israeli sovereignty over the Golan Heights region, despite a change in policy by the United States. 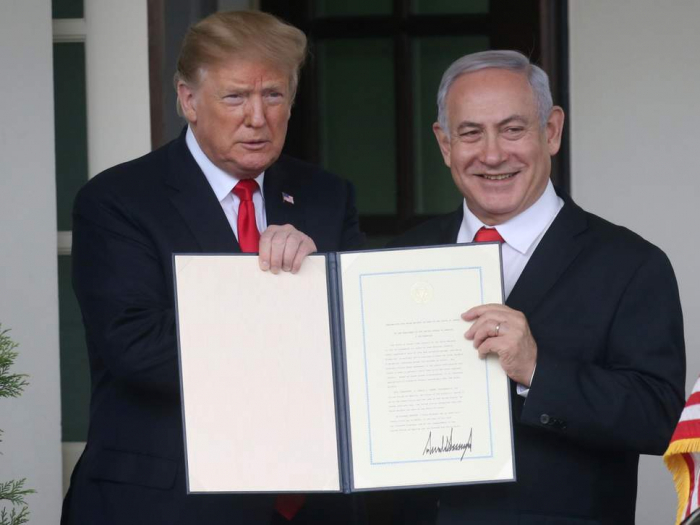 This week US president Donald Trump signed a presidential proclamation officially recognising Israel’s control of the area, which it has occupied since 1967 when it captured the region from Syria during the Six Day War. But in a statement approved by the European Council’s 28 members, the EU’s high representative for foreign affairs said: “The position of the European Union as regards the status of the Golan Heights has not changed. The territory is widely internationally recognised as belonging to Syria’s Arab neighbour. Israel’s prime minister Benjamin Netanyahu said Mr Trump’s recognition was “historic”, while Syria said it was "blatant attack” on its sovereignty and pledged to take the territory back by “all available means”. Turkey and Russia also voices opposition to the move. The change in US policy is likely to prove a domestic political boost to Mr Netanyahu, who faces elections on 9 April. The recognition is the latest policy unveiled by Mr Trump to break with longstanding policy over Israel. Last year the president announced he was moving the US embassy from Tel Aviv to Jerusalem. Israel says Jerusalem is its capital, but most foreign embassies are based in Tel Aviv because of the holy city’s disputed political status. That decision saw the Czech republic, Hungary, and Romania follow the US’s lead and announce varying degrees of recognition for Jerusalem as Israel’s capital. This week Israel launched more air strikes on the Gaza Strip, another area under its military occupation, after Palestinian militants fired rockets into Israeli territory. Local authorities say the strikes hurt at least 15 Palestinians, including two women and a child.